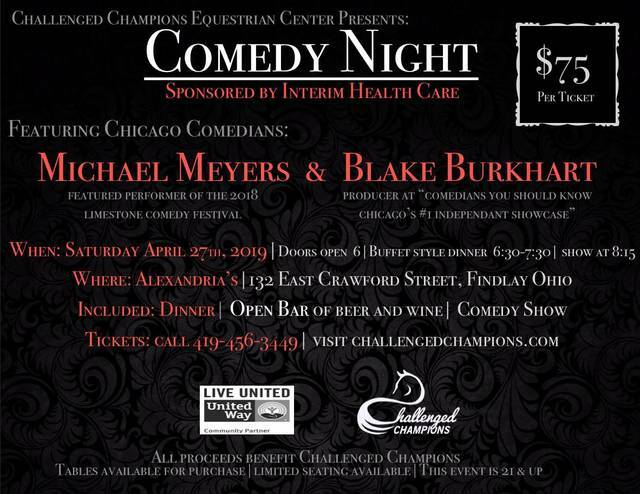 Challenged Champions Equestrian Center Comedy Night: 6:30 p.m., Alexandria’s, 132 E. Crawford St., Findlay. Tickets $75 at 419-456-3449 or challengedchampions.com. Doors 6 p.m.
FINDLAY — Challenged Champions Equestrian Center, of Ottawa, will present Comedy Night at 6:30 p.m. Saturday, April 27, at Alexandria’s, 132 E. Crawford St., Findlay. The night will feature comedians Michael Meyers, featured performer at the 2018 Limestone Comedy Festival, and Blake Hurkhart, producer at “Comedians You Should Know, Chicago’s No. 1 Independent Showcase”. Tickets are $75 and include dinner and an open bar with beer and wine. They’re available by calling 419-456-3449 or visiting challengedchampions.com. Dinner will be from 6:30 to 7:30 p.m. with the show following at 8:15 p.m. Doors open at 6 p.m.